Saturnia, the ancient Etruscan-Roman Aurinia, is one of the oldest towns in Italy. Saturnia is famous above all for its thermal waters, famous for the beneficial and healing properties, waters that flow from the source, after a long underground path that starts from the summit of Mount Amiata, at a temperature of 37.5 ° C. The Terme di Saturnia Spa & Golf Resort are an elegant and refined spa complex with swimming pools, hydromassage, hydrotherapy routes in the water and a spring water pool, a wellness center for beauty treatments and massages. 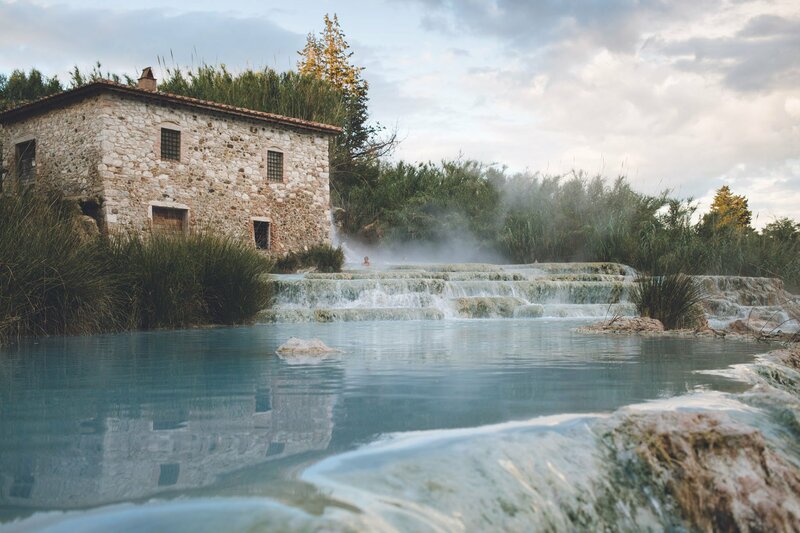 A few minutes from the spa, the wonderful Cascate del Mulino, considered the most beautiful free thermal baths in Tuscany, are one of the most famous spa destinations in the world. The waterfall pours sulphurous thermal waters into the pools naturally carved in travertine. .. wonderful!